A bad debt recovery is business debt from a loan, credit line or accounts receivable that is recovered either in whole or in part after it has been written off or classified as a bad debt. Because it generally generates a loss when it is written off, a bad debt recovery usually producess income. In accounting, the bad debt recovery credits the allowance for bad debt reserved category and reduces the accounts receivable category in the books. Are there any laws governing debt recovery? Yes, the laws govern this recovery process and ensures fair debt recovery practices. Banks and NBFCs are regulated by Recovery of Debts Due to Banks and Financial Institutions (RDDBFI) Act and SARFAESI Act. 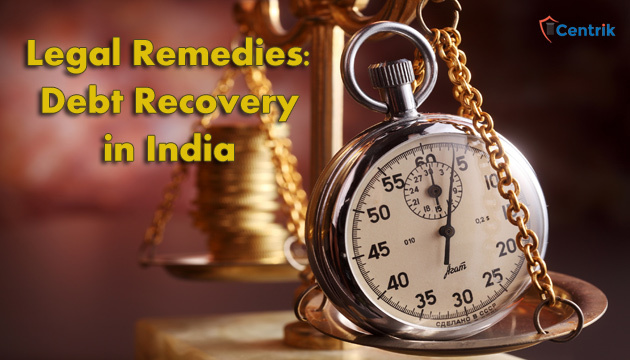 There have been a lot of recent changes in SARFAESI Act to increase the efficacy of Indian Debt Recovery Laws.The cases pertaining to Banks and NBFCs are dealt with at the Debt Recovery Tribunals (DRT). Similarly corporate bodies are also resorting to various measures to recover their unpaid money, either by adjudicatory or non-adjudicatory methods. What are the Legal and Non-Legal Remedies available? Litigation does seem tedious and hard to understand but here is a flowchart that will explain you the whole procedure in the simplest manner possible while valuing your time and efforts. Call conference with the client for better understanding of the situation. Preparation of draft under Order 37 of Civil Procedure Code and collection of other documents for substantive representation at the court. Service of notice for amicable settlement of the issue. Service of formal legal letters informing about the settlement and court procedures in advance. Meetings in person for amicable settlement in a persuasive manner. Filing & representation at the appropriate civil & or criminal proceedings against the debtor. Lodging a complaint before the regulator about the malpractices undertaken by the debtor. Pursuing the litigation and obtaining the orders from the appropriate judicial courts or quasi-judicial authorities. Conveyancing for outside court settlement by way of arbitration. The debtor will be bound by court orders and serve the penalties. Non-Legal Methods are generally opted by those businesses who value their business relations above any other aspect but also want their unpaid money back, whereas Legal Methods are the last resort for the companies who have tried every possible way and could not yet realize their money. No business wants to lose their customers but these long outstanding dues hamper the goodwill of the body corporates which further affects their business abruptly. Keeping this in mind the corporates are going an extra mile now to recover their bad debts which is going to enhance the economic status of the country in coming days.